Absolutely pristine Castellano Plan at Shadow Hills Sun City. This 2 bedroom plus den/office and 2.5 bath original owner home is in move in condition with tile throughout except for the bedrooms.The large island kitchen with slab granite counters, breakfast nook,stainless appliances all opens to the great room with upgraded fireplace and views of the rear yard.The two bedrooms are on opposite sides of the home with the master having huge walkin closet,soaker tub and separate walkin shower. The south facing rear yard has been beautifully improved with oversized rear patio, alumawood patio cover,walkways,artificial grass, an overall low maintenance system. The two car garage plus golf cart garage has custom storage cabinets and evaporative cooler. This home has a great floor plan which makes for easy living. Come See!! 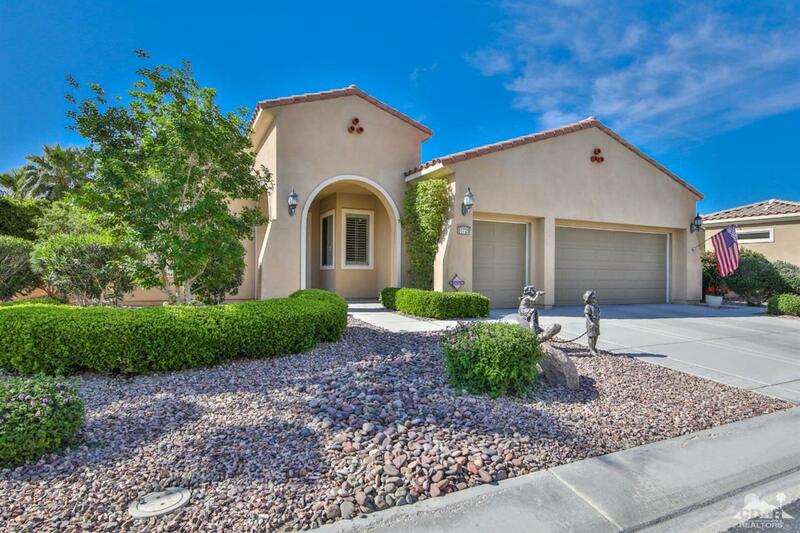 Listing provided courtesy of Bill Taylor of Desert Elite Properties.